Wow it seems like there have been a lot of birthdays this weekend. My bosses was Sunday but we celebrated it here at work on Thursday. I got to make a gluten free, organic chocolate cake...from a box. It didn't smell very good, and J did not want to lick the bowl, but after it was cooked and frosted it was actually okay. Thursday was also my dad's birthday and Friday was my grandma's and R's (who's the only one that really matters in this story). Friday I left work at 10. I never do that so it was a huge shock for R. I wanted to take him down to San Diego for lunch and a trip through the Body World exhibit but with the drizzly weather and the roll over accident next to our house we thought it would be best to just stay in. 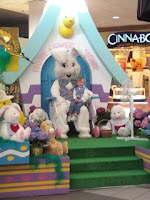 Not to mention daycare probably would be less then ecstatic if we ran late on Good Friday. Heck we had originally planned to go to Disneyland, free birthday and all, but that plan was foiled when we realized it was Easter weekend. Thursday I had made R's chocolate cake. A deliciously sinful, full sugar, full gluten cake with sour cream frosting. Staying in on Friday gave me a chance to whip up some butter cream icing and decorate the cake. He wanted me to make roses, so I could practice, but with only a half hour to pick up, there just wasn't time. I grabbed the boy, the cake and off we went to pizza with his family. Where R and his brother got in an argument on the state of our economy. Why or why? It's so interesting to see how different two people form the same family can be, especially since they are only a couple years apart. Despite that bit of tension it was a really relaxing dinner, for me at least. On Saturday we didn't do much in the morning and headed over to a carnival for about an hour in the evening. J rode one ride and was done. Thankfully he had a blast playing games and even got three ping pong balls in the little floating cups. Since I had purchased tickets for two rides I just had to use the rest of the tickets myself. Unfortunately the carnival was pretty ghetto and the only ride that looked safe was the Tilt-a-whirl. It was fun the first few times around but then it got pretty monotonous. By the time I got off I felt sick and my arm hurt, very strange. Guess I'm getting old. blah. Sunday was a really great Easter! 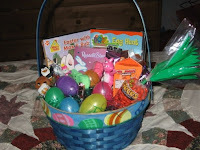 Other then trying to make it down to brunch, where my uncle works, in time for the egg hunt, there was no stress. It was nice. When we got home it was nap time. I guess the sun wore me out because I ended up falling asleep in J's bed. When he woke grandma came over and we dyed eggs. I think the adults had much more fun then J, as he lost interest after about 10min. I had been planning on trying out a gluten free cupcake recipe for my daughter's class (her teacher is allergic to gluten) but now you have me thinking that I should experiment some first. Any suggestions? This was actually the first time I've made anything gluten free. It was pretty good after all was said and done, but the cake was tiny. I should have used both packages of the mix rather then just one to make a 2 layer cake. My coworkers loved it, so if you're interestedin the brand I can look at home. I think they got it at Costco. Actually, I remembered it was two girls names so here it is. http://www.sofellafoods.com/ And the picture on the front of the box HAS to be with both mixes. Cool! Thanks. Even sweeter is the idea of being able to pick it up at Costco, my home away from home.